Hillsboro’s Mark Gallimore stiff arms a Chillicothe defender on Friday at Richard’s Memorial Field in Hillsboro where the Indians battled the Cavaliers in FAC football action. The Hillsboro Indians lost their first game of the season on Friday when they fell to the Chillicothe Cavaliers 36-30 at Richard’s Memorial Field in Hillsboro. The Indians had a chance to tie the game on a second and ten play from the Cavaliers 10-yard line but running back Josh Keets was stopped just short as time expired. Keets was the unofficial rushing leader for the Indians in the game and carried the ball 19 times for 174 yards including 37 and 44 yards. Deon Burns was the scoring leader for Hillsboro as he found pay dirt three times in the game with the first two coming on one yard rushes and the third on an 18-yard scamper that gave Hillsboro the lead with 5:33 to play in the game. The first touchdown of the night for the Indians was scored by Mark Gallimore from eight yards out and Gallimore stiff armed a Cavalier defender on his way to the end zone. Ja’Quan Harris was the engine of the Chillicothe offense as he unofficially rushed for more than 220 yards in the game and had two rushing touchdowns and one receiving. 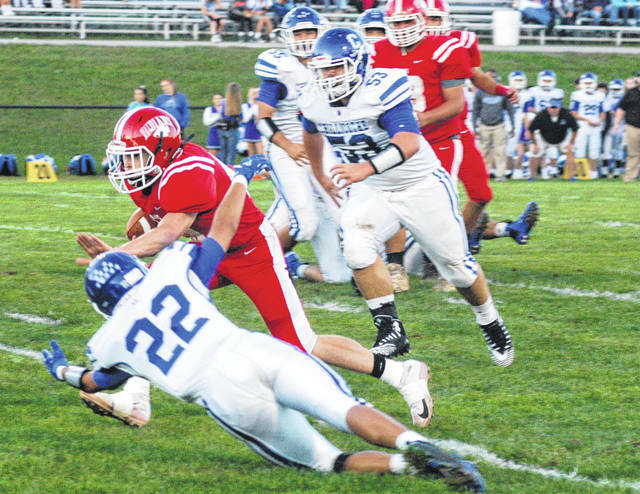 Chillicothe quarterback Adrian Beverly and wide receiver Zach Coats were also effective against the Indians as they connected for two touchdowns of 19 yards. Chillicothe received the kickoff to start the second half and were leading 20-14 when they started their drive at their own 15-yard line and proceeded to march right down the field for a touchdown and they converted the two-point try to double up the Indians 28-14 early in the third quarter. From there Hillsboro scored 16 unanswered points to take a 30-28 lead midway through the fourth quarter. Between the two scoring drives for the Indians Chillicothe put together a long drive that started at their own eight and got down as far as the one of the Indians before Hillsboro stopped them four straight times to force a turnover on downs. On the Indians’ ensuing drive it appeared that Hillsboro would be forced to punt from their own end zone. But, Hillsboro Head Coach Jack O’Rourke chose to roll the dice and the Indians executed a perfect fake punt that saw Logan Hester take the ball all they way to the Hillsboro 40-yard line for a first down. Hillsboro had several chances to tie the game and possibly take the lead on the final drive of the game. First Indians’ quarterback Mason Swayne tried to connect with Luke Middleton in the end zone that the receiver was unable to pull in. However a pass interference call against the Cavaliers gave Hillsboro a new set of downs with under 15 seconds to play. On the next play Swayne spotted Keets in the end zone but again they were unable to make the connection. Finally on the final play of the game Keets took the handoff and rumbled towards the goal line form the 10 but was stopped just short as time expired. Hillsboro will be back in action next Friday when they travel to Washington Court House to take on the Blue Lions for their second Frontier Athletic Conference game of the season. Chillicothe will travel to McClain next Friday to battle the Tigers in FAC play.